Earn a digital Professional Development Certificate and show off your newly acquired skills and competence. When you successfully complete this course you will receive a Professional Development Certificate for 3 CPD Hours. The course requires a time commitment of approximately 3-hours. You can learn in your own time and unlike a live workshop you can revisit the content and resources as often as you like, going over any of the lessons or course material at your own pace. The course includes video tutorials, template clauses and checklists for practice in addition to written and other resources. Our multiple choice quiz will test your knowledge. You will also have exclusive access to a private discussion group where you can ask questions, share learning and practical tips. Provide credible proof of skill and competence and earn a digital certificate when you successfully complete this course. Our digital certificates use blockchain credentialing technology and enable you to show off your skills on LinkedIn profiles, websites and your digital CV. This course carries 3 CPD points. Mediator Academy is a Recognised Course Provider for the Chartered Institute of Arbitrators. All our courses have been rigorously assessed for our evidence-based approach to learning design methodology, and the quality of content has been optimised for the online classroom. 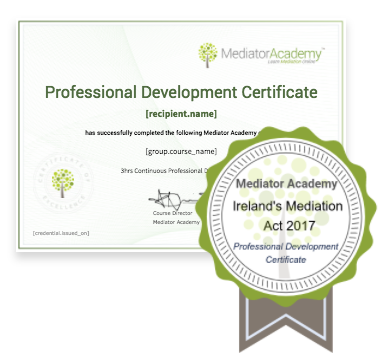 Following the enactment of the Mediation Act 2017, Mediation in Ireland is now here to stay. This course will equip you to meet the new and onerous duties placed on lawyers, mediators, advisors and parties to mediation. Sabine has primary and higher degrees in law and left legal practice 10 years ago to work in mediation. Her practice areas include family, civil and cross-border mediation. She has served three years as President of the Mediators’ Institute of Ireland and played an active role in lobbying for the passage of the Mediation Act, 2017. She writes extensively on mediation and was one of the editors and chapter authors of Kluwer’s EU Mediation Law Handbook, 2017. Aled has 15 years experience in the field of mediation both as mediator, educator, writer and international speaker. He is passionate about improving the quality of education available for mediators and ADR professionals as well as improving standards of practice. 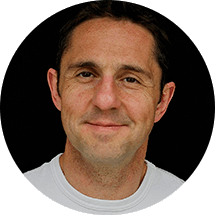 Aled has combined his interest in mediation and innovation to develop an online educational institution providing thought leadership in the form of courses and masterclasses and is the founder of Mediator Academy. "As a lawyer with little or no experience of mediation I wasn’t entirely sure whether this course would be useful. What I got from the course however was not just the knowledge but also the confidence to support my clients through mediation. The course materials were of very high quality and the checklists and templates extremely useful, not to mention the 3hrs of CPD. I highly recommend this course." "I thought I knew all I needed to know about the legislation, as it turns out this course proved I was wrong! The video interviews, interspersed with other multimedia really kept my interest up and the momentum of the course going. The calibre of the material and expertise of the tutor was outstanding. I strongly recommend this course especially useful to understand how the legal profession interacts with the work of mediators"
"As a private family mediator this course makes the complexities and the legalities of The Mediation Act 2017 concise and succinct. I logged in, clicked on the course and began. The course was very well presented and the multi-media format and variety of learning methods kept me engaged. The certification and CPD points at the end added to the sense of achievement. I'd recommend this to any of my colleagues." To cover the core materials of the course, you should invest a minimum of 2hrs. This time can be broken up into chunks. To assist you in planning your time, the time commitment for each learning activity is indicated. 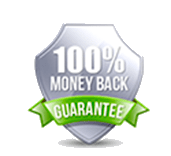 If you wish to spend more time on the course, you can dig deeper into activities, retake quizzes and other tests and of course delve into the additional resources provided. You can access this course for one month and work through the content as often as you like. Once you have successfully completed the course and the final assessment you'll then receive your certificate and 3 hours CPD. You will also have continued access to the Private Discussion Group to draw on the wisdom and support of peers. This course is aimed at mediators working in all sectors, legal practitioners including solicitors and barristers. 1. The course is spread across multiple modules, each one builds on what has been learned in the previous one.